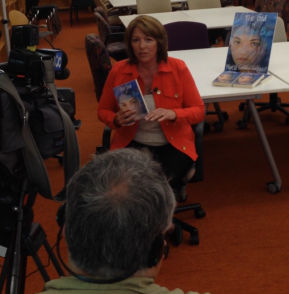 Turn on Portland’s Channel 8 (KGW) at 4pm today to look for my book, the God of Sno Cone Blue, during the newscast! For those of you outside the Oregon/SW Washington viewing area, I will post a link later. Or subscribe to this site if you’d like direct email updates. I appreciate the nod to summer reading, and I’m thrilled by another endorsement, not to mention coverage from a top-25-market TV station! As for the book, If you’re intrigued by the premise of a dying mother who writes letters to her daughter about family secrets, then my novel is for you. 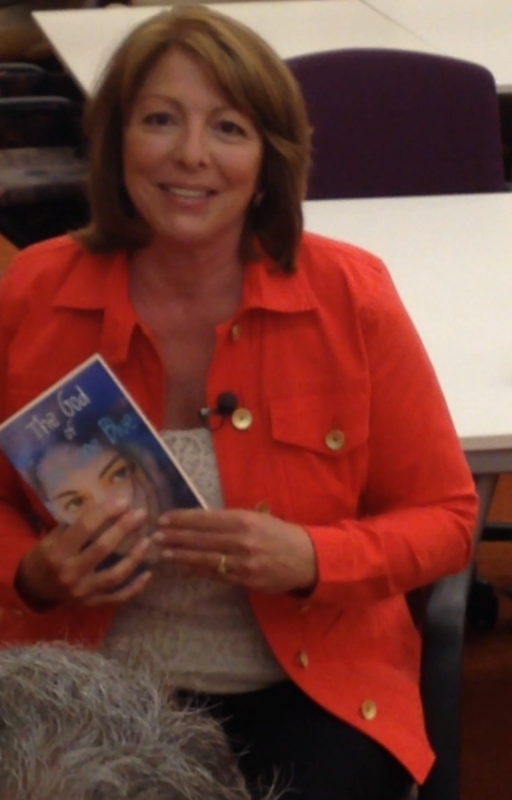 It’s also a good read for book clubs, since I included a Questions and Topics for Discussion page in the paperback. And if your book club is in the Portland metro area, I’d be happy to visit your group, just take a minute to contact me. Photographer Rod Stevens was on hand for the KGW interview and did a wonderful job of putting me at ease. Yes, I used to work as a broadcaster (for another network-affiliated Portland station), but that was a long time ago: almost 18 years! So, it helped to have a skilled photographer who knows how to launch a meaningful conversation. Rod asked good questions that demanded more than yes or no answers. And he showed a genuine interest in writing and self publishing, which was an unexpected plus. Funny thing is, I was nervous enough that I hardly remember what I said, so the content of the finished story will be a surprise to me! The event he covered (and took pictures of) was my book signing at a Marshall High School all-years reunion, which made it doubly significant. Many of my classmates were there (in our old school library) to catch up, and I was thrilled, even overwhelmed, by their support for my book. 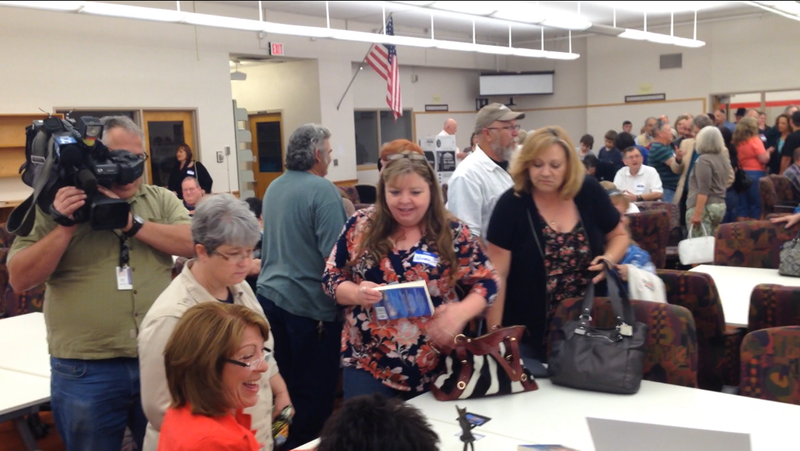 My hand didn’t exactly get tired from signing copies, but my heart was full. They all had me laughing and, later on, alone in my car, blinking back tears. So, to each and every one of you, it means more than you know. Thank you, thank you! Class of 1978: Has it Really Been that Long? Visiting the old school was bittersweet for all of us, since the district closed it several years ago. The old library shelves along the walls were empty, as were the classrooms. The building is still in limited use, but I think we’d all like to see Marshall as a bona fide high school again with many books on its library shelves–heck, including mine! …Someday maybe… For now, I’ll be content with seeing my classmates on KGW and celebrating the exposure and support for my book! This entry was posted in News and tagged 5-star reviews, A great summer read, Book Signing, Channel 8, good read for book clubs, high school reunion, KGW-TV, summer books, summer reading, television coverage, the god of sno cone blue, top-25-market TV station, writing by Marcia Coffey Turnquist. Bookmark the permalink. Kathryn, thanks so much for your comments. I’m thrilled you’re enjoying the book and very flattered to have it compared to The Poisonwood Bible–that is a wonderful story and unforgettable. Did we meet? Do you mind me asking how you heard about my book? Again, thank you for the kind words! Yay Marcia! I will tune in. I’m so happy that things are going in a positive direction for you. You’ve worked hard for it! Keep me “posted,” get it? 🙂 Sorry . . . it’s still early! Love ya. Looking forward to meeting you this week! Thank you, Cathy! I always learn something from the book clubs I visit with. I’ve met so many fun and accomplished women. I look forward to meeting you too.